Arlo Guthrie, Remembering 'Alice's Restaurant' Forty years ago, Arlo Guthrie dumped a pile of trash. The minor crime made him ineligible for the draft. In 1967, he immortalized the saga in "Alice's Restaurant." Debbie Elliott hears the story behind the song. Forty years ago, Arlo Guthrie dumped a pile of trash. The minor crime made him ineligible for the draft. In 1967, he immortalized the saga in "Alice's Restaurant." Debbie Elliott hears the story behind the song. Mr. ARLO GUTHRIE: (Singing) You can get anything you want at Alice's Restaurant. Now it all started 40 years ago this Thanksgiving. Mr. GUTHRIE: (Singing) You can get anything you want at Alice's Restaurant. Walk right in. It's around the back just a half a mile from the railroad track. And you can get anything you want at Alice's Restaurant. ELLIOTT: That's when 18-year-old Arlo Guthrie, son of folk legend Woody Guthrie, dumped that pile of trash which landed him in a heap of trouble. On his debut album in 1967, it took Arlo Guthrie more than 18 minutes to explain in song how littering on Thanksgiving made him morally unfit to face the enemy in Vietnam. Long after the Vietnam era, demand for "Alice's Restaurant" remains so strong that Arlo Guthrie has to serve it up every so often. Here, 40 years later, is Arlo Guthrie. Hello. Thanks for being here. 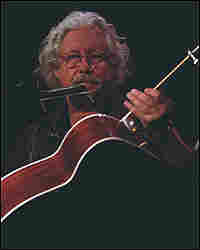 Mr. ARLO GUTHRIE (Folk Singer/Songwriter): I can't believe it's 40 years later. I'm listening to my voice singing that thing and I'm going, `Who would have thunk?' It's scary. ELLIOTT: I guess you're a little more careful now where you throw your trash? Mr. GUTHRIE: Well, I guess so. I mean, you know, you can't get away with stuff anymore these days and, frankly, you couldn't even in those days. And I might have exaggerated a little and the movie didn't help, you know? ELLIOTT: Why don't you remind us again the inspiration for your song--the story behind the song? Mr. GUTHRIE: A lot of people thought it was fiction and this is all real stuff. I had visited my friends during the Thanksgiving break, Ray and Alice, who lived in this abandoned church. They were teachers at a high school I went to just down the road in the little town of Stockbridge, Massachusetts. And a friend of mine and I decided to help them clean up their church, and because I had gone to school there, I was familiar with all of these little back roads and nook-and-cranny places. And I knew a place that local people were using to get rid of their stuff. Mr. GUTHRIE: (Singing) ...till we came to a side road. And off the side of the side road was another 15-foot cliff and it--at the bottom of the cliff was another pile of garbage, and we decided that one big pile's better than two little piles, and rather than bring that one up, we decided to throw ours down. So it wasn't like some pristine virgin forest that we'd--you know, were screwing around with. And our pile of garbage, well, we couldn't tell the difference once we threw ours down. But there was someone who could and that happened to be the local chief of police, a guy named Bill Obanhein, who we called Officer Obie. And he confronted us that next morning after Thanksgiving with our crime. Mr. GUTHRIE: And I turned it into a little story. And then, of course, I decided to stay out of school because the civil rights movement was going on, the ban the bomb, clean the water, fix that, do this, you know, I mean, all the world was changing and I wanted to be where that was happening. And so I left school and, of course, that made me eligible as it were to, you know, join up and get sent over to Vietnam. And I didn't really want to go and little did I realize that when I went down to the induction center that they--well, they found me ineligible, and I just couldn't believe it. And so I turned it into a song. It took about a year to put together, and I've been telling it ever since just about. ELLIOTT: So do you remember the first time you actually played "Alice's Restaurant" for an audience? Mr. GUTHRIE: Well, the first time I started talking about it some of the events hadn't taken place. I started it the night that Officer Obie called. He called in the daytime--in the morning--the--which would have been Friday after Thanksgiving, 1965. We went and we picked up the garbage. We went back and we were sitting around the kitchen in the church that night. And I had a guitar and we were making up funny little verses like, `You can hide from Obanhein at Alice's Restaurant,' stupid stuff. We were just, you know, just hanging out. And it wasn't a song and there was no story. We were just having fun. But as the draft scenes unfolded in my real life, I began to include them in the song and it took about a year to put that together. ELLIOTT: So you would just add a little as your life happened? Mr. GUTHRIE: I was adding to it, and if it was funny and it was true, I kept it. And if it wasn't funny and people didn't respond to it, I dropped it. And so it was really--you know, it was performance art that I just memorized the best parts of. The only thing I really miss about doing it these days is that there's maybe a few people in every crowd that haven't heard it, but it's nothing like having the few hundred or a few thousand people years and years ago--40 years ago--when nobody had heard it. Those moments can't be repeated. And not only that, there were people singing this song together who politically had nothing in common and probably wouldn't have talked to each other. But to see them all singing together reminded me of the spirit of what the country was all about, and I was thrilled. And, unfortunately, those days are gone for me. Not--that can't be repeated. ELLIOTT: What do you think it was about that song that was able to capture everybody's attention? Mr. GUTHRIE: Well, you know, I wasn't sure at first, but I thought it's probably just a story of a little guy against a big world. It's just a funny tale, and I had--I still have--and I cherish the letters and the postcards and the pictures I got from the guys over in Vietnam, you know, who had little Alice's Restaurant signs outside these tents in the mud and who would be quoting the song, you know, to their superiors or to each other when their superiors had no idea what they were talking about. It became an underground thing not just here, but, you know, everywhere with guys on all sides of the struggles over there and the struggles that were going on here. And it overcame--it actually became now--really, it's a Thanksgiving ballad more than an anti-war this or a pro-that or whatever it was. And I think it could only happen here. ELLIOTT: I read somewhere where you talked about "Alice's Restaurant," saying it's not so much an anti-war song as a song against stupidity. Mr. GUTHRIE: Well, it's celebrating idiocy you might say. I mean, thank God, that the people that run this world are not smart enough to keep running it forever. You know, everybody gets a handle on it for a little while. They get their 15 minutes of fame, but then, inevitably, they disappear and we have a few brief years of just hanging out and being ourselves. And that--you know, I was talking to one of the guys who just got back from Iraq, you know, and he was nervous and concerned about all of the stuff that's going on. And I reminded him--he was a young guy. He wouldn't have the experience of somebody who had been around for a while. I said, `Listen, things happen for a while. It's like a river, you know? It can go one way and then it goes another way, and it goes back the other way and it goes back--there's no rivers that run straight.' And I don't know if he believed me or not, but the truth is if he lives long enough, and I hope he will, he'll see that these things do come around again. Here we are 40 years later and we have an unpopular war overseas. Everybody will agree with that. And the times are eerily familiar to when this song came out. And here I am, 40 years older, I'm looking at myself--I'm hearing myself from 40 years ago and I thought, `Who would have thunk, I mean, that this song would still not only be popular but have some relevance?' I'm just smiling. I'm just thinking about it. ELLIOTT: Did you ever get to perform "Alice's Restaurant" for your dad or parts of it? Mr. GUTHRIE: That's the family joke, you know? I mean, I wrote this in '66 and my dad passed away in '67. The record hadn't come out, but in those days, we made test pressings out of acetate. And my manager, who was my dad's manager also, took the acetates to the hospital where my dad was and played him the record. And, of course, the family joke is he heard the record and died. So he died very soon after that. ELLIOTT: So you don't really know what he thought of it? Mr. GUTHRIE: Well, I can imagine, but--I can imagine the smile on his face is all I can say, because I know he would have enjoyed at least the sense of humor, and I think he would have been surprised. You know, he didn't actually know me as a performer. I never knew my dad as a performer either. I missed that, but I work with my kids and I'm getting a great deal of pleasure watching my own kids play music. And I'm sorry my dad didn't get to see all of that but maybe he's seeing it anyhow. ELLIOTT: This week, Arlo Guthrie celebrates the 40th anniversary of that Thanksgiving Day that inspired his classic song "Alice's Restaurant." Arlo Guthrie, thank you so much for joining us. Mr. GUTHRIE: It has been a pleasure, Debbie. Thank you. Mr. GUTHRIE & Audience Members: (Singing) You can get anything you want at Alice's Restaurant. Mr. GUTHRIE & Audience Members: (Singing) You can get anything you want at Alice's Restaurant. So walk right in. It's around the back and just a half a mile from the railroad track. And you can get anything you want at Alice's Restaurant. Mr. GUTHRIE: Ta, da, da, da, da, da, da, at Alice's Restaurant. ELLIOTT: That's ALL THINGS CONSIDERED from NPR News. I'm Debbie Elliott.